Located just east of Colorado Springs, Falcon is a growing area that offers comfortable and spacious homes in a prairie setting with high mountains on the western horizon. Falcon is a small community with big city amenities, which allows you to live in a quiet, peaceful area without having to endure the hustle and bustle of the city. Median home prices here are $195,400 although some homes have been on the market for as low as $163,500 for a 4-bedroom rancher. There are many parks and bike paths interlaced throughout the neighborhoods. The Centerpiece of all this is the Antler Creek Golf Course, one of the finest courses in the region. Also nearby is Corral Bluffs, one of the regions newest open space acquisitions. The trails there interlace through spectacular and colorful sandstone formations that are unforgettable. Most of the students here attend Falcon High school in Falcon District 49, where a teacher was just recently nominated for the Presidential Mathematics Award. Falcon offers a well rounded and challenging curriculum designed to prepare the students to be future leaders and stewards of the community and the environment. Falcon is one of the closest communities to Schriever AFB and it is just a few minutes drive down the Falcon Highway to the south to get there. Hwy 24 is the main thoroughfare west and provides access to Peterson AFB, Powers area theaters, restaurants and shopping as well as Downtown Colorado Springs. Woodmen Rd, to the Northeast, provides easy access to North Colorado Springs and I-25. With its first-rate education, golf courses and open spaces, ease of access to urban areas and military bases, Falcon is a very affordable and pleasant place to call home. 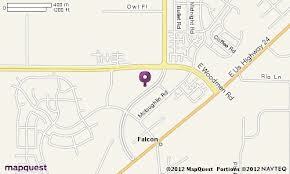 Search the #1 site for Falcon Real Estate listings.